If you live in a tropical climate, you may be interested in learning a few iguana facts. Knowing some facts about these reptiles will help you deal with them in your garden where they can cause quite a problem. Most people think of plants when they hear the term "invasive exotic". 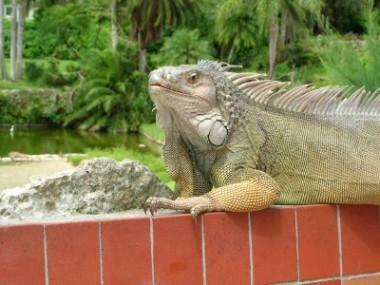 However, one of the most destructive invasive exotics in the south part of Florida is the iguana. Iguanas are not Florida natives. They actually come from southern Mexico as well as Central and South America. Iguanas have not come to the United States willingly though. They have been imported through the exotic pet trade. Uneducated consumer buy a little, green iguana thinking that they require minimal care. When they find that their new pet needs a fairly elaborate pen as well as adequate heating in order to be healthy they realize that this pet require more care than they had anticipated. As this little reptile grows to a large and possibly aggressive animal, owners feel that releasing the animal into the environment is an idea solution. The iguanas most commonly seen in Florida include Iguana iguana or the common green iguana, Ctenosaura pectinata or Mexican spiny-tail and Ctenosaura similis or black spiny-tail. Iguanas are herbivores but occasionally they will eat insects, other lizards and small animals. Their herbivorous nature, however, isn't the only thing that gets them into trouble. While iguanas often enjoy basking on sidewalks and seawalls, they also tend to dig burrows where they hide and lay their eggs. These burrows cause erosion and possibly the collapse of the structure they have burrowed near.Iguana droppings are also a problem. Not only are they unsightly and smelly, they also can carry salmonella. A large population of iguanas in your landscape can cause quite an unsanitary mess. Wild iguanas can also be dangerous. Usually they will avoid people, but if they feel cornered they will fight if they cannot escape. Injury can be caused to people and pets with the iguana's sharp teeth and claws as well their whipping tail. Iguanas also enjoy vegetable garden favorites such as broccoli, beets, lettuce, squash and melons. Fruits are also frequently a part of the iguana diet. Iguanas also avoid toxic and thick-leaved plants. It is a good idea to learn to live with these animals if you are able. Do not feed them as this will encourage them to stay and produce more iguanas. Unfortunately, there are no repellents on the market that will get rid of iguanas. Sometimes, just annoying them will cause them to move on to another location. Just do this carefully to avoid getting hurt. If you cannot get them to leave your yard, you can try protecting your prized plants with a cage or screen. Trees can be skirted with sheet metal to make climbing difficult. It is also smart to remove environmental factors that may make your yard seem appealing. For example, thickets, rock piles and mounds of mulch all are features that an iguana will be happy to call home. If all else fails, try contacting your local extension office to find out if you have a professional in your area that will trap iguanas on your property. Legally, you are permitted to use live traps and snares yourself, but then the removal of the animal becomes a problem. Iguanas are protected by anti-cruelty laws so it is best to have a professional take care of the problem for you.